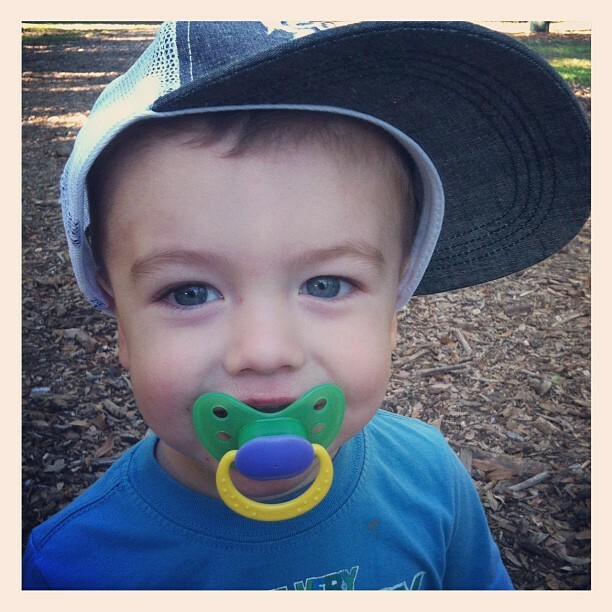 I remember the good ol’ pre-parenthood days when I used to say my child would never use a pacifier. That didn’t last too long once we were home from the hospital. I quickly realized that Lincoln had other plans, and I had three options before me. One-nurse him around the clock like he was trying to insist on. That didn’t sound like fun. Two-have a thumb sucker on my hands. He was already trying to get his hands into his mouth even with his only days old hand-eye coordination. Three-Give him a pacifier. So paci it was. That thing quickly became a lifesaver for a baby who had a constant desire to have something in his mouth. I learned to ignore the judging glances in public and tune out the comments. That bad boy gave me lots of extra peace and quiet in life, so to heck with the haters. Following in the footsteps of his Uncle Tyler that he looks so much like, Lincoln became obsessed. Obsessed. Wanted that thing ’round the clock. He didn’t call it anything for a long time, but in the past several months, he affectionately named his pacifier, “Yellow”, since both colors we had had yellow on them. Yellow was the third color he learned to say (behind blue & purple), and he hasn’t stopped pointing out every yellow object in sight since. He started this funny thing where he calls things and people by whatever color they are. We were at the park a few months back and when I told him we were leaving, he looked at a little boy wearing a blue shirt and said, “Bye, Blue!” So that’s how the paci came to be known as Yellow. I have heard that word so, so many times. When he wanted it, the whining began. “Yellow! Yellow, Momma. Yeh–heh–lowwwww”. Mike & I have been scheming this past week on what we were going to do to get rid of ol’ Yellow since Lincoln’s birthday is next month. We had elaborate plans. We would take it to his favorite park and put it on the train and say the paci went bye bye on the train. Or we would toss it in the lake and say the fish needed it. (That didn’t sound too eco friendly) Maybe we would cut the end of it off to see if he would just get over it on his own. Well, yesterday Mike called me to say that Lincoln lost Yellow at my mom’s office. We used to have a dozen of them, but recently they’d started to disappear, so we were down to only two. One was lost. I could easily ditch the other one. So there we had it. No elaborate goodbyes. He lost it. End of story. I wish I would have counted how many times he has asked for it in the past 24 hours. Let’s just say many, many times, but he did go to sleep without it last night and went down for a nap today without it. So I guess that’s that. Another step to my little baby growing up. Oh, Yellow. You’ve been a good friend. Unfortunately, the 2-year mark is upon us, so we must bid you farewell. I think I’ll miss you more than he will. right now, Ellie is screaming refusing to take a nap, and I surely miss paci….Funny how some things we stress so much about just kinda happen :) I was looking at pictures of her with the paci last night and it is crazy how much older they seem without it, and how much more they talk! Hope y’all are doing well!!! We told Lilly that we gave it to a baby that didn’t have one…She reminded me often of how she gave it to the little baby. Love that photo of Lincoln! We took Logan’s paci away cold turkey too and I definitely miss it more than he does, lol! He stopped asking for it after the second day. Amazing how quickly they forget.